* Starts with a loud burst of fruity floral. You’ll also get some juicy citrus and peach with a hint of white floral. * It starts off a bit screechy and loud but calms down after about 30 minutes. * As the scent gets sweeter, it gets quieter. * Softens to a nice skin scent of vanilla and clean musk. 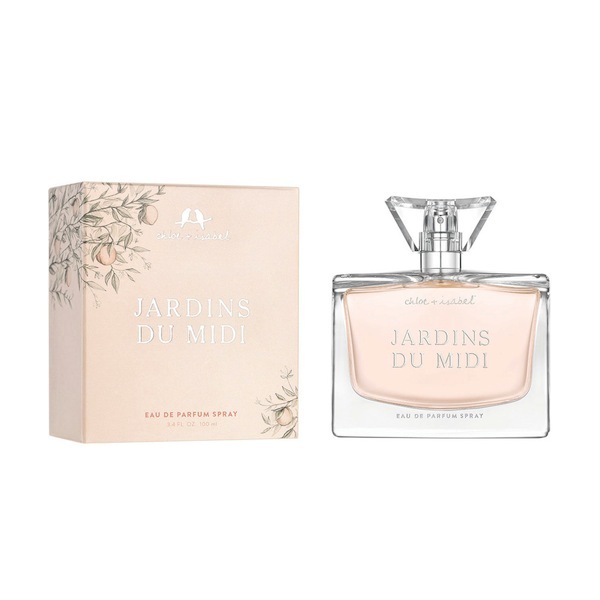 Summary: Jardins du Midi is the first fragrance from direct sales company Chloe + Isabel (like a modern take on Avon, focusing on accessories and jewelry). It is a well-constructed and easily wearable fruity floral that clearly leans feminine and is office-friendly (after the first hour). Longevity is good, at more than 10 hours, so it will get you through a workday. The scent matches the quality of any designer scent that you would find at a department store, and while it doesn’t break any new ground it would be a safe and enjoyable gift for friends in your life who want a nice, modern perfume. Chloe + Isabel Jardins du Midi Fragrance is available from RLBelles Boutique. Disclaimer: Sample provided by publicist. Image courtesy of Chloe and Isabel website.